This week’s episode of Endeavour takes a Scooby-Doo twist, complete with a haunted mansion, creepy little girls, and a historical mystery. Most series have one or two murder-in-the-past episodes, practically all the Sherlock Holmes short stories have some link to history, with Poirot it’s Five Little Pigs and Elephants Can Remember, with Father Brown The Sign of the Broken Sword, with Morse The Wench is Dead. 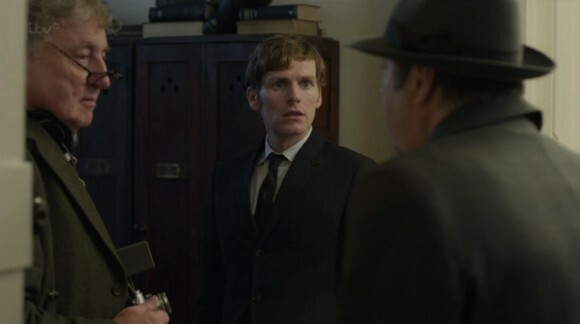 Endeavour goes back to a mass murder in the 1800s. Morse becomes involved while investigating a murder in a museum. Questioning witnesses leads him to a girls’ school, where a small band of students are staying for the summer holidays. Soon enough he senses foul play and delves into the place’s history, discovering the legend of Bloody Charlotte, the only survivor of the Victorian massacre, and possibly the culprit. Needless to say, this means the house is haunted, and quite a few heart-thumping sequences ensue. Honestly, Morse and Thursday (while showing their usually quality) take backseat to the small, earnest drama in the school, and the excellent performances from the young actresses. All the same, the Morse-Monica romance takes an expected twist, and it remains to be seen if we’ll be revisiting that situation. On the humor front, football plays a large role, with Morse’s total disinterest contrasting with the avid fanaticism of everyone else at the station (including Thursday.) Strange has a few amusing moments—I hope we get to see more of him in future, and what with the whole Masons thread, I wouldn’t be surprised. Full of red herrings that had me and my parents conjecturing wildly, the case ends up boiling down to a solution that is more believable than last week’s, but that feels more incredible when contrasted with the rest of the story, which is nicely compact and linear. In Trove, everything was so complicated that the solution had to be mad. In Nocturne, there was a feeling of dark realism that required a more satisfying solution than the one given. It’s not helped by the fact that the reveal takes up twice as much space as it should, and gives us time to start thinking about how repetitive the music is getting and how ridiculous all this explanation is. Poor Roger Allam just sits there glumly and lets Shaun Evans talk at him, occasionally throwing out a question or two. On the other hand, I was certain the killer was a different person…based on my long history of murder mysteries I can usually identify the stereotypes, but this time I was pleasantly mistaken. At the very last, a poignant revelation surprised us all, and lent a graceful sorrow to the last few moments. Also, Colin Dexter Cameo Alert! And another enjoyable segment with Abigail Thaw, who reminds me so much and so little of her father. But it's bad form to bring him up every time she's mentioned; she's a great character and actress in her own right. It's still a little bizarre for her to call Evans "Morse," however, and this seems to be emphasized. What do you mean by a poignant revelation at the end? I'm referring to Charlotte's true affliction: she wasn't a murderess but (SPOILER) had Down Syndrome. That was why she was locked away. This episode has to feature the slowest race to the scene ever as they drive to the school carefully through the dark to save the day while Morse details the family history to Thursday. Unintentionally hilarious! I half expected one of them to say "Slow down on this turn here..."
Yeah, I'm pretty sure they filmed the entire drive from Oxford to the house in real time.